A recycledcomet-smashing probe has begun a new mission to seek out alien worlds beyondour own solar system. 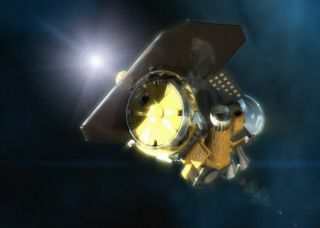 Thesurviving mothership of NASA?s DeepImpact mission, which released an impacting vehicle that slammed into acomet in 2005 to learn more about it, is now aiming its largest telescope atfive different stars to catch a glimpse at any planets they may harbor. ?We?re onthe hunt for planets down to the size of Earth, orbiting some of our closestneighboring stars,? said Drake Deming, deputy principal investigator of DeepImpact?s planet-huntingEPOXI mission, in a statement. Deep Impacttrained its largest telescope on its first target on Jan. 22 to look for dipsin the star?s light, the tell-tale sign of a planet crossing in front of itsstellar parent as seen from Earth. ?We cananalyze this light to discover what the atmospheres of these planets arelike," said Deming, a researcher at NASA?s Goddard Space Flight Center inGreenbelt, Md. Each of thefive target stars on Deep Impact?s list is known to host massive,close-orbiting extrasolar planets the size of Jupiter or larger, missionresearchers said. About thesize of an mid-size sport utility vehicle, Deep Impact?s flyby spacecraft carriestwo telescopic cameras - one for high-resolution and another formedium-resolution - which it used to observe the crashof its impactor probe into the Comet Tempel 1 on July 4, 2005. The EPOXImission is a combination of two separate science investigations designed tomake the most of the Deep Impact spacecraft. In addition to the planet hunt,known as the Extrasolar Planet Observations and Characterization (EPOCh), thespacecraft is also en route to a swing-by of Comet Hartley 2 on Oct. 11, 2010. The comet investigation,dubbed the Deep Impact eXtended Investigation (DIXI), will map gas outburstsfrom Hartley 2 and search for water ice.